The 2010 World Series of Poker (WSOP) late last month. The annual Las Vegas spectacle features a gathering of the top poker pros from around the world and among them is Poker Discussion forum moderator and longtime community member Tristan Cre8iveWade. In the months leading up to this year’s WSOP, the Floridian final tabled the PokerStarsSunday 500 in February for $47,000 and won the PokerStars $100 rebuy ($20,000 Guaranteed) twice in December for a combined $46,000. He sat down with PocketFives.com to recap the first few days of the annual tournament series. PocketFives.com: Thanks for joining us from Las Vegas. Tell us what you’ve played so far in the 2010 WSOP. Tristan Wade: So far, I’ve played in the first $1,000 No Limit Hold’em WSOP event, the first two $1,500 No Limit Hold’em WSOP events, and a $1,000 tournament at the Venetian. They have gone pretty well so far and I really like how I’ve played. I have made minimal mistakes and if I keep playing well, I know a victory or a deep run will come soon enough. I’ve almost made every dinner break so far in the WSOP events, which is an accomplishment getting through the beginning stages of those short-stacked tournaments. If you make it through the first day, you are almost in the money. 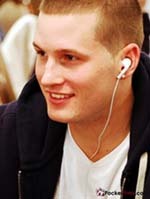 PocketFives.com: What’s your approach in the large-field $1,000 and $1,500 No Limit Hold’em events? How have you been able to survive? Tristan Wade: I just take what the table gives me. The fields have a good mix of players in them, so you have to get a feel for your opponents before you decide a plan of action. Once I get a feel for everything, that’s when I strategize. I try to survive to the antes at the worst and the game becomes a lot easier once you make it to those stages. PocketFives.com: Are there differences in the skill level of the fields at the Rio and the Venetian? Tristan Wade: There are soft spots and tough players in both fields. It’s a big mix all over. I’m sure that the Rio probably attracts more recreational players, but the Venetian tournaments are still good. I haven’t played enough at either place to really tell yet. PocketFives.com: What’s your schedule going forward? What other events will we be seeing you in? Tristan Wade: I will play probably play all of the $1,500 events and will definitely be playing other tournaments besides No Limit Hold’em. It will be a good change of pace to play different games. I’m just going to try to pick good spots. If there are some down days for the WSOP, then I will check out the Venetian tournaments. PocketFives.com: Are there must-sees and must-do’s for you while you’re in Las Vegas or is the trip all business? Tristan Wade: I try to have fun and keep it balanced. Aside from going to the gym, there are a lot of great restaurants and things to do here. Whether that’s going to a nightclub or a show for entertainment, I try to have fun too. I will make it out to some of the casino pools. I went to the Red Rock Canyon last year and that was nice. Just enjoy the city and see as much as you can. Every year I come to Vegas, I always explore more and have a lot of fun finding new things to do and places to go. PocketFives.com: Is there anyone you want to lend a shout out to? Tristan Wade: I want to thank everyone for their support. I’ve met a lot of great people in the poker world and it’s nice to see my friends having success. I know I’m lucky to be where I’m at regardless of how this summer goes, but I hope I can provide some good sweats.